Since he was promoted to Dai Shihan last year, Nagato sensei has been teaching directly from the densho. His powerful taijutsu re-encountered the basic forms of the ryûha and helped us deepen our taijutsu. This summer apparently, he is going back to his regular way of teaching and I must say that it is a renewed pleasure. I have been following his classes since the opening of the old honbu in 1997, and I can see a new depth in his movements. I had the same epiphany when I taught the tenchijin, the ryûha and the weapons to Shiva’s students in India. 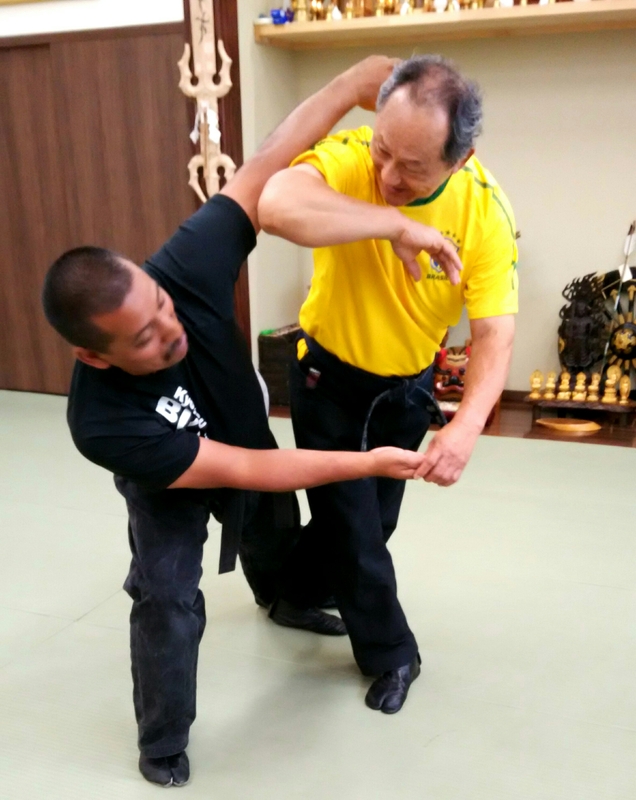 I noticed that my body moved in a more subtle and powerful way after reviewing with them, all the techniques of the Bujinkan. During the class, Nagato sensei used a technique done by one of the high rank attending his class and taught his “ri” (1) vision of the Ganseki principle. It was simple and soft and terribly efficient. Efficiency had never been an issue for him, but I felt that he improved more, if possible, his general understanding of taijutsu. Speaking of Ganseki he said that we do not have to do it like in the basic form, but adapt it seamlessly to Uke’s attacks. The basic forms are there to teach beginners the general body mechanics. It is another thing to make them useful to survive an actual fight. We did many variations around Ganseki, changing from the basic form to many non orthodox ones. Sometimes only his arm, totally bent, would be used as a lever to throw his opponent; sometimes, he would simply hold lightly the top of the fingers of uke and, with a shoulder and full body movement, would throw him in a variation of Ganseki Nage. Each time his distance and busy angle would adapt to the openings of his partner. It was brilliant. Following exactly what Sensei is teaching in his classes these days, his movements are all connected. The tsunagari (2) matches exactly (3) the intentions of uke. There is no thinking, only a natural reaction of his body. If I had to summarize this fantastic class I would say that if Nagato sensei’s taijutsu was good, it just got better. And again, I think this is because he matters his basics and spent a year reviewing them through the densho. If you are a teacher, please review your ryûha regularly because there are still many gems for you to find there. If you are a student, be happy to be training these basics, because they are building the strong foundation of your future. Please try to let go of the cosmic movements. They are often unrealistic and will give you a wrong feeling of security. Your survival is hidden in the quality of your basics.